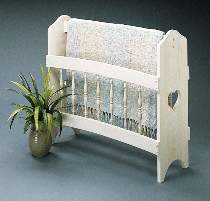 This quilt rack will add much comfort to family rooms, guest rooms or any room in a home. This well-designed quilt rack can hold any size quilt. Our FULL SIZE plans make all pieces easy to lay out and cut. Measures 32"L x 31"H x 14"D. Order #9862 Quilt Rack hardware separately.